This chapter summarizes our ongoing research on topological spatial reasoning using the Region Connection Calculus. We are addressing different questions and problems that arise when using this calculus. This includes representational issues, e.g., how can regions be represented and what is the required dimension of the applied space. Further, it includes computational issues, e.g., how hard is it to reason with the calculus and are there efficient algorithms. Finally, we also address cognitive issues, i.e., is the calculus cognitively adequate. Jochen Renz and Bernhard Nebel. 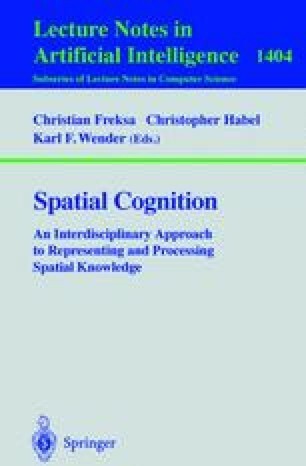 On the complexity of qualitative spatial reasoning: A maximal tractable fragment of the Region Connection Calculus. In Proceedings of the 15th International Joint Conference on Artificial Intelligence, pages 522–527, Nagoya, Japan, August 1997. Technical Report with full proofs available at http://www.informatik.uni-freiburg.de/~sppraum.